In the world of Malaysian noodles, pan mee faces some strong competition. Wan tan mee or Hokkien mee are hawker favourites, as are pork noodles, beef ball noodles, fish head noodles… the list goes on. Yet dry chili pan mee has become a legendary kind of comfort food in KL, spawning several popular chain restaurants. 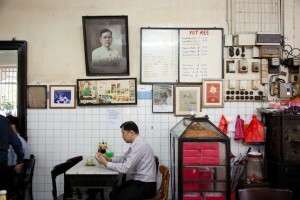 This niche was carved out by one man, who single-handedly changed the notion of pan mee with Restoran Kin Kin. The traditional pan mee, thought to be Hakka, is most commonly rolled out flat and cut into quarter-inch wide strips, and the noodles are served either in soup or slicked in soy sauce. The signature of the dish (when served dry) is the addition of mince pork and crunchy fried anchovies. Mix them all, and you get a deeply savoury mouthful that works well with the thick, bitey noodle. The original pan mee was hand torn into thick, doughy pockets of dough about the size of ravioli – though in no way as delicate. The trick is to cook them to perfection, so that the dough remains al dente but the middle isn’t raw. In the year 1985, however, all this changed. 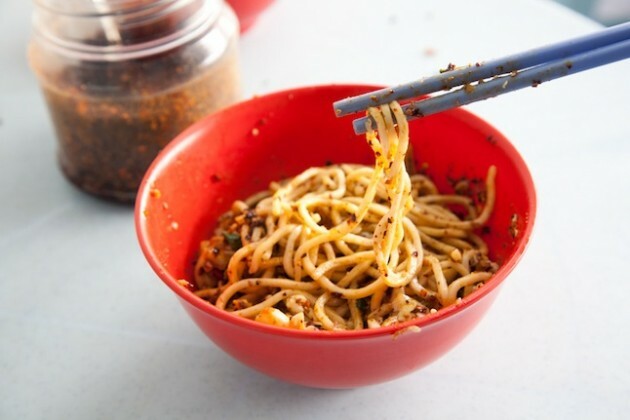 One man created a version of pan mee that would spearhead the trend of pan mee from that point onwards – the chili pan mee. 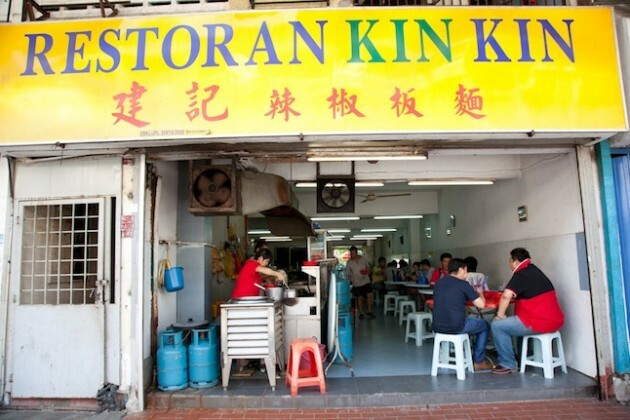 Tan Kok Hong, 70-year-old owner of the legendary Restoran Kin Kin, is responsible for reinventing the dish while testing Malaysians’ threshold of heat. 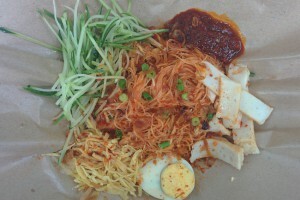 The white noodle is rolled out like regular pan mee, but made thinner and rounder like spaghetti. 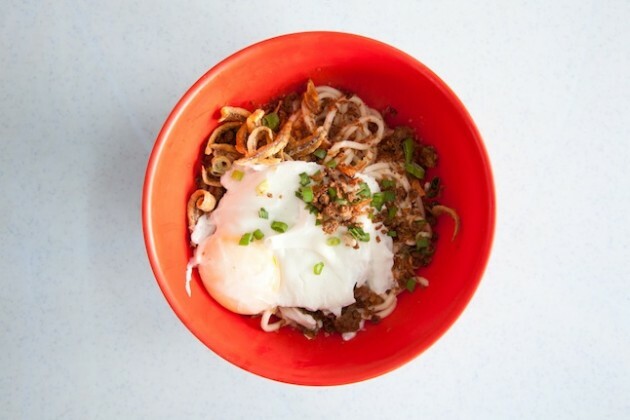 The noodles are chucked into a plastic bowl, and topped with a poached egg, anchovies, minced pork and green onions. Chili paste is scooped onto the noodles and everything is tossed everything together so the chili and egg coats every strand. The result is a fiery punch in the gut, a thoroughly heart-stopping combination of ingredients that awakens the senses. The ingredients are cheap and attainable, the serving style simple, but the dish achieves a delicious complexity. 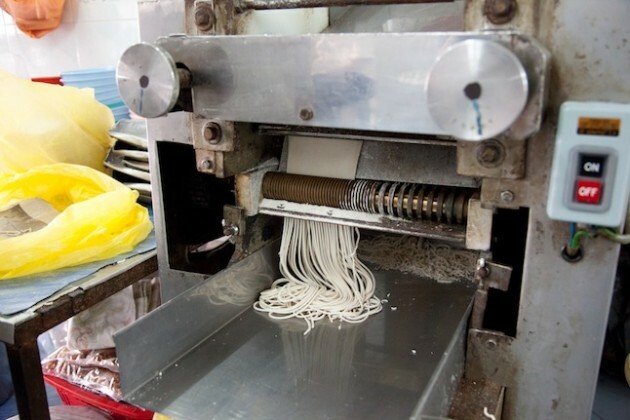 Kok Hong’s noodles are all handmade, rolled out fresh daily and cut using a machine. Back in the day when his shop was just a stall beneath a tree, he used to cut the noodle by hand everyday. The luxury of a roof over his business in 2000 has permitted a machine and additional staff, igniting a higher turnover rate for these little bowls. Kok Hong rolls out five bags of dough in eight hours. The man is clearly passionate about pan mee, when he empahises that his pan mee is free of preservatives, unlike to yellow egg noodle. “Mi kuning ada ubat, satu minggu boleh tahan,” he says. The chili paste, he explains, is a pounding of fried chili and oil. The sticky, hot stuff is what sets Kin Kin apart, as the proportion of each ingredient is difficult to replicate. Meanwhile the poached egg is a wobbly wonder, and seems to consistently ooze in utter grace every time I knock one with a spoon. Tan says practice makes perfect when it comes to the eggs, there’s no egg poacher or timer in sight, but every single yolk flows into a pool on your noodles. “Kita tengok dengan mata saja la,” he laughs. Other shops in KL soon started serving this dry chilli pan mee, in the same style. Super Kitchen is a franchise with eight outlets across the Klang Valley, whose flagship outlet is located just opposite Kin Kin. Although their portions of noodles are bigger, I feel the chilli is less flavoursome. However, they do have their own in-house specialities – such as serving a broth with bean curd skin, pork balls and potato leaves. What does Kok Hong have to say about Super Kitchen? “Cili dia bukan wangi, lembik sikit.” He’s obviously not worried. Jojo Little Kitchen has also been upholding the status of chili pan mee, and is especially popular among college students. Adolescents accessorised with laptops crowd the restaurant and slurp on pan mee dishes of all styles, and on my trip, chili pan mee was the order on most tables. The version here is well prepared, but once again, the chili isn’t as fiery as the pioneer stall’s blend. But Jojo also serves various soup versions of pan mee, and their outlets span from Sri Hartamas to Subang Jaya, which means that they are a convenient choice for those in need of an immediate pan mee fix. 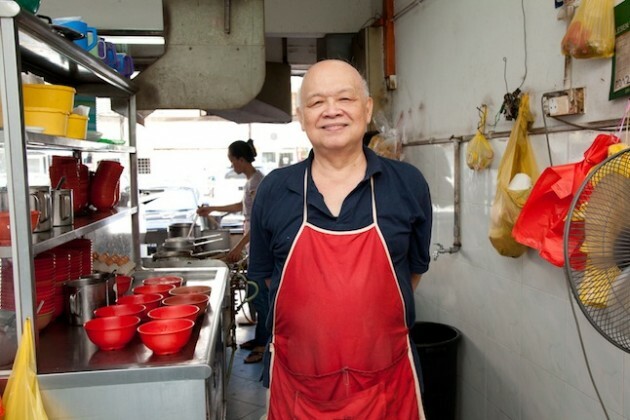 Kok Hong says he can’t pin down why his version of dry chilli pan mee is more popular among the young, pointing out that most of his older customers opt for the soup version. 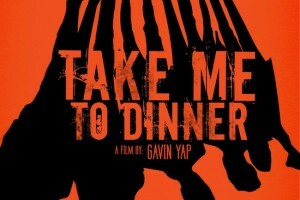 But he certainly kicked off a trend with his twist on a classic Malaysian dish. Now Kin Kin now has a dedicated stall in Publika’s EAT food court, where customers can sample the original recipe while enjoying the comfort of air conditioning and ample spacing. Of course, people still flock to the original shop in Kampung Baru. Just remember, when you do: two spoons of chili is plenty.